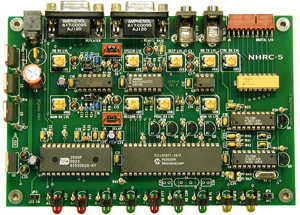 The NHRC-5 is a linking repeater controller with real stored speech. Its highly integrated design, built with state-of-the-art components, results in a powerful controller with a low parts count. This increases reliability and lowers cost. Secondary port for remote base, link radio or slaved duplex repeater. Control Receiver or Secondary Receiver. User Audio Test Mode allows Repeater User to hear their own audio. Auxiliary Audio Input for weather receiver, site audio, etc.. Distinctive Courtesy Tones can indicate channel activity and link status. Copyright © 2001-2019, NHRC LLC, all rights reserved.